New new waterless Pelican version offers year-round sweeping that has proven to significantly increase pick-up of fine particles over traditional, wet-dust control sweepers. Elgin Sweeper, the leader in environmentally efficient street sweepers, has introduced the latest version of its legendary Pelican® three-wheel broom street sweeper now available with waterless dust control. The new sweeper recently made its public debut in February at the World of Concrete 2009 tradeshow in Las Vegas. "Not only has Elgin Sweeper addressed our municipal, industrial and contractor customers' need for high-efficiency dust removal, we are also helping to conserve water across North America with a sweeper that we believe will prove to be more efficient and more effective in sweeping streets and roadways," said Brian Giles, sweeper products manager at Elgin Sweeper. "We're confident that our customers will be happy with the results." In addition to maintaining all the popular features and sweeping quality that have made the Pelican the best-selling three-wheel sweeper, the new waterless version offers year-round sweeping that has proven to significantly increase pick-up of fine particles over traditional, wet dust control sweepers. Added benefits include water conservation and fast, easy clean-up. The Waterless Pelican delivers 99 hp and meets all California fugitive dust control standards (Rule 1186, PM-10) in waterless dust control mode. The flagship product at Elgin Sweeper, the Pelican has been America's most popular urban street sweeper for generations. The redesigned Pelican combines economy and single-lane dumping with a sweep system that easily handles heavy, compacted dirt and bulky debris, as well as smaller particles found in the street. "The new waterless Pelican reinforces Elgin Sweeper's role as the leader in environmentally efficient sweepers, and takes its place next to the industry standard truck-mounted waterless sweeper, the Waterless Eagle," Giles said. "Elgin Sweeper is committed to providing municipalities, industries and sweeper contractors with environmental solutions that reduce storm water run-off and air pollution, and this new machine continues that commitment." 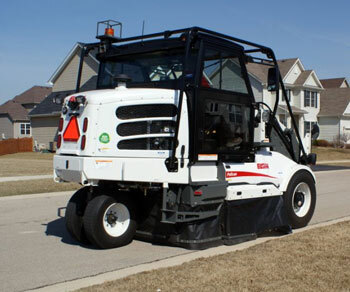 With more than 90 years of experience, Elgin Sweeper offers municipalities, contractors and industries the most sweeper options in the country, using the latest sweeping technologies, including waterless dust control, alternative fuel, dust filtration, mechanical, pure vacuum and regenerative air. For additional information on the Eagle sweeper featuring the M2 chassis or to schedule a demonstration, please visit www.elginsweeper.com or see your local Elgin Sweeper dealer. If you have a question or comment, please let us know. If appropriate, we'll add it to the bottom of this page.